Gabriele Kraus-Gruner, Maike Rönnau, Klaus Fröhlich-Gildhoff, Eva Füssinger (Eds.) 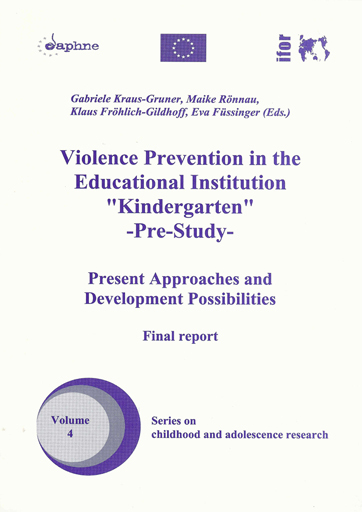 (2008): Violence Prevention in the Educational Institution "Kindergarten" - Pre-Study. Present Approaches and Development Possibilities. Violence prevention and peace education are supposed to be self-evident elements of the kindergarten work. However, practice shows that in everydaylife the implementation is not that easy. This problem does not only appear in Germany, but also in many other countries. Thus, the following central questions arise: Which compe-tencies do educators and parents need for children to grow up non-violently and to develop their potential? What kind of general conditions are necessary for a consequent and sustainable implementation of peace education and violence prevention in kindergartens? In a comparative-explorative study promoted by the EU that included six European countries, the current approaches to the implementation of violence prevention and peace education in kindergartens were gathered. Initially, the aim was to conduct a first review of the situation which should form the basis for the development and the subsequent implementation of a multimodal program on peace education in kindergartens.